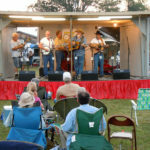 A fiddlers convention is a gathering of people who like to play string music and those who like to listen or dance. Musicians come for friendly competition, camaraderie, and to show and hone their skills. 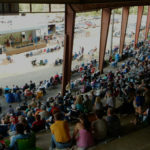 Others come to see and hear the contest, scout around the fairgrounds for hot jam sessions, and sample the fare of a variety of vendors. Sponsored by the Elk Creek Valley Volunteer Fire Department and Ladies’ Auxiliary.